Acting U.S. Census Bureau Director Ron Jarmin stands in the lobby of the agency's headquarters in Suitland, Md. The bureau is facing six lawsuits from more than two dozen states and cities, plus other groups, that want a new question about U.S. citizenship removed from the 2020 census. The head of the U.S. Census Bureau says the controversy over a new question about U.S. citizenship on the 2020 census is complicating its preparations to conduct a national head count. For the first time since 1950, the Census Bureau will ask all U.S. households about citizenship status, specifically, "Is this person a citizen of the United States?" "Controversy about the content of the census does complicate our messaging," acting U.S. Census Bureau Director Ron Jarmin says in an exclusive interview with NPR. Jarmin is overseeing the 2020 census, the once-in-a-decade head count of every person living in the U.S. as required by the Constitution. "We need to get responses from everybody whether they like the question or they don't like the question," says Jarmin, an economist who has served at the bureau since 1992. "We need to be able to get both sides of this debate to respond to the census." The interview is Jarmin's first with a news organization since stepping in last July to lead the bureau, and it comes as preparations for the next national tally in 2020 are already drawing criticism over security and privacy concerns as well as legal action over the citizenship question. The bureau is facing six lawsuits from more than two dozen states and cities, plus other groups and individuals, who want the question removed because of fears that it will discourage noncitizens from participating and harm the accuracy of the census. As NPR has reported, some noncitizens plan to avoid answering the 2020 census because they are scared of sharing their information with the government. Commerce Secretary Wilbur Ross, who oversees the Census Bureau, approved adding the question to census forms in March. Ross has said the Justice Department needs responses from the question to better enforce the Voting Rights Act's provisions against racial discrimination. Internal documents the Trump administration recently released as part of the lawsuits are fueling suspicions that the decision to add the question was politically motivated. Jarmin says the lawsuits are creating "uncertainty" for his bureau and that the longer they persist, they increase "potential cost and risk to the program." Still, Jarmin insists, he is "confident" the bureau can get a "good, complete and accurate census" regardless of the outcome of the lawsuits. These population counts touch the lives of people across the country. Census numbers help determine the balance of political power — they are used to determine how many seats in Congress and how many Electoral College votes each state gets, and they affect how legislative districts are drawn. In financial terms, an estimated $800 billion in federal funds is distributed every year based on the head count. Asked how he would respond to people who say they're afraid of taking part in the head count, Jarmin defended the security of the census, saying the bureau always has a need to "encourage people to participate in the census regardless of the content of the form." "Responding to the census is safe and secure, and we only use the data for statistical purposes," he says, "so fears that we're going to use the data and to give it to law enforcement agencies and things like that are unfounded. We do not do that." "Confidentiality is [an] absolutely critical element of the success of our mission and so we take that very seriously," he says. Still, some critics of the citizenship question — including Terri Ann Lowenthal, a former staff director of the House Subcommittee on Census and Population — are worried about whether people will trust the government with their personal information at a time of increased immigration enforcement under the Trump administration. "Regrettably, I think because of the anti-immigrant debate and rhetoric ... more and more people are going to be afraid to turn personal information, especially if it's about citizenship, over to a government agency," she says. "Even if that agency is simply collecting statistics." Lowenthal is now a consultant and advises the Leadership Conference on Civil and Human Rights, which has filed an amicus brief for one of the citizenship question lawsuits. She says it is ultimately up to elected officials, local religious leaders and social service agency heads to "carry the message that it's both safe and important to their families and the well-being of their communities to participate in the census." To conduct past head counts, the bureau has received permission to hire noncitizens as temporary census workers for their special language and cultural skills. The Washington Post reported in January that Census Bureau staff were told during a meeting that the agency was not planning to hire noncitizens for 2020. But Jarmin says that some staffers may have "misinterpreted" an explanation about federal hiring laws and that the bureau is "going to be exploring every option." "We need to get a complete and accurate census," he says, "and we will do everything we can to ensure that." The bureau's preparations for 2020 include keeping a close eye on social media to monitor any misinformation about the head count, which is set to take place at the same time as the 2020 presidential race. Asked if he was worried that there could be a tweet from President Trump that does not match the bureau's messaging about the 2020 census, Jarmin says, "I'm not too concerned about a tweet from the president in that regard. But I'm concerned about tweets from anybody that somehow, you know, if it gets enough traction, that that is giving the public bad information about the census." Amid all the uncertainty, another question facing Jarmin is how long he will stay as the Census Bureau's acting director. During a Senate hearing in May, the commerce secretary said the White House was "processing" a potential successor but did not announce a name. Jarmin says he doesn't know who that person is or when he might be replaced. The head of the U.S. Census Bureau is preparing to face a major challenge. His agency is required by law to count every person living in the U.S. in 2020. But the bureau is running into many hurdles, including a legal fight over a new citizenship question. NPR's Hansi Lo Wang sat down with the bureau's acting director for his first news interview since stepping into the role a year ago. 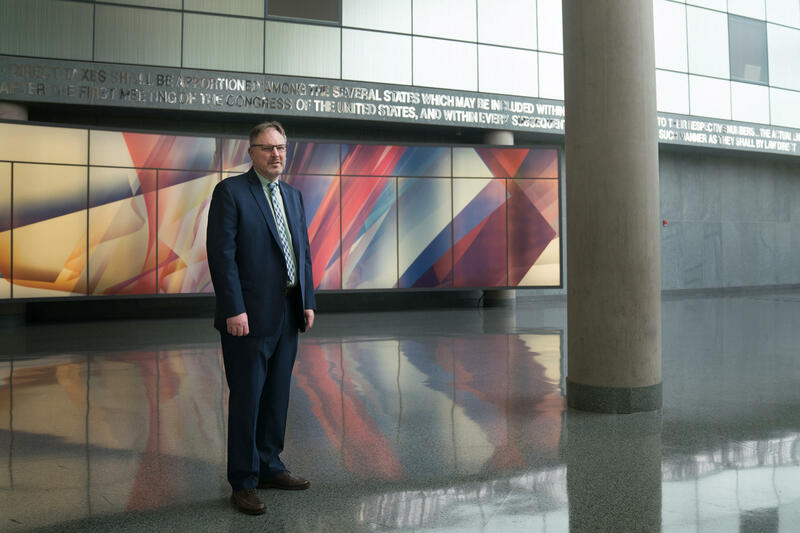 HANSI LO WANG, BYLINE: Ron Jarmin leads more than 4,000 employees from the Census Bureau's sprawling headquarters. But these days, he's focusing more on the millions of people outside the bureau's glass walls, all the people the Constitution says the government must tally up every 10 years. RON JARMIN: Who is supposed to be counted? All residents are supposed to be counted. WANG: And when you say all residents, does citizenship status matter? Does immigration status matter? WANG: It's a responsibility, Jarmin says, that the bureau takes seriously because the power of these numbers last for a decade. JARMIN: Whether it's funding for streets or for schools or for health care, decisions throughout the federal government are made based on the population of the local communities that people live in. WANG: Not to mention how many seats in Congress and Electoral College votes each state gets and how legislative districts are drawn. And there's been growing concern that the 2020 count will not be accurate. More than two dozen states and cities are pointing to a new question asking whether a person is a citizen of the U.S. That has led to so far six lawsuits filed against the bureau. JARMIN: Controversy about the content of the census does complicate our messaging. We need to get responses from everybody whether they like the question or they don't like the question. WANG: The citizenship question was added by Commerce Secretary Wilbur Ross, who oversees the bureau. Ross has said the Justice Department needs responses from it to better enforce the Voting Rights Act. But Jarmin and other researchers at the Census Bureau warned Ross that adding a question could discourage noncitizens, and that could put the accuracy of the next head count in jeopardy. While the federal courts sort out the question's fate, Jarmin says his agency is moving forward with plans to ask about citizenship status in 2020. JARMIN: The longer we go without knowing exactly what's going to be on there, that could be a risk. WANG: The risk of giving personal information to the government is weighing on the minds of many noncitizens at a time of increased immigration enforcement under the Trump administration. JARMIN: We want to make sure that people know that it's safe and secure to answer the census and that it's important that they answer the census. WANG: Federal law prohibits the Census Bureau from releasing any information that would identify individuals, but the bureau can release anonymized information about specific demographic groups living in specific neighborhoods. And that, says Terri Ann Lowenthal, a former staff director of the House Oversight Subcommittee for the census, does raise concerns about trusting the government to not use that information against people. TERRI ANN LOWENTHAL: The Census Bureau can tell people till it's blue in the face that the law provides the strictest protection for the confidentiality of census information. But people are only going to be convinced if community leaders carry the message. WANG: Ron Jarmin says he's hoping more local leaders step up in time to rally interest in the upcoming census and to share accurate information about the head count that's taking place at the same time as the 2020 presidential race. Jarmin says the bureau is planning to keep a close eye on social media. Are you worried that there could be a tweet from President Trump that doesn't match the bureau's messaging about the 2020 census? JARMIN: I'm not too concerned about a tweet from the president in that regards, but I'm concerned about tweets from anybody that somehow, if it gets enough traction - that is giving the public bad information about the census. JARMIN: Amidst all this uncertainty with the 2020 census, there's another question. Ron Jarmin is the acting director of the Census Bureau. And he says there's no word from the White House about when he might be replaced. Hansi Lo Wang, NPR News, Washington. (SOUNDBITE OF MADE IN HEIGHTS' "AMARANTHINE") Transcript provided by NPR, Copyright NPR.